The Norse 1050 design uses a proven double chine hull form to produce a robust, seaworthy craft, with good stability and load carrying abilities. 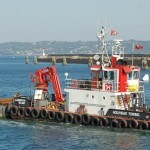 It is capable of being used in a wide variety of workboat roles. The Norse 1050 can accept a number of wheelhouse sizes and a wide range of engine/propulsion and equipment combinations to enable the vessel to be configured for a broad variety of tasks. Potential uses for the Norse 1050 include Crew Transfer, Patrol Duties, Hydrographic Survey, Harbour Launch, Pilotage and Safety Boats. The design and construction techniques that are used to build the Norse range enable vessels to be built specifically to individual customer requirements. 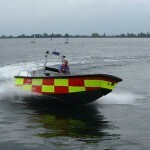 This vessel type is one of a range of similar workboats ranging from 8.5m to 16m in length that are available in aluminium or steel construction. All the Norse range of workboats have a central helm position with good all round visibility and easy access to controls and instruments in both the console and the overhead instrument panel. Dependent on the wheelhouse arrangement, accommodation may be designed to include berths, galley and toilet facilities.